GRAPHISOFT, the leading Building Information Modeling (BIM) architectural software developer, has announced the update (Build 8000) for ARCHICAD, BIM Server and BIMcloud 19 and all other components: BIMx, MEP Modeler and all GRAPHISOFT-distributed Add-Ons and Goodies. ARCHICAD 19 takes the next quantum leap in BIM performance by extending its robust 64-bit and multi-processing technologies with predictive background processing, an industry-first to BIM. As a result, ARCHICAD now offers lightning-fast response times, making it the undisputed speed leader in the BIM business. 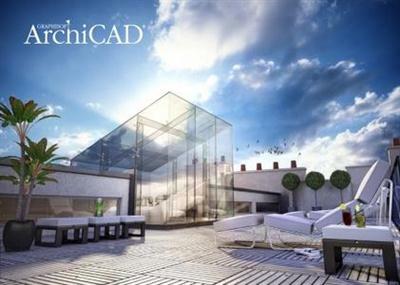 This Update contains various enhancements and fixes since the original release of ARCHICAD 19. 216288 BIM Server/BIMcloud/DOCUMENT: Deleted Interior Elevation segments could re-appear in the Project Map after sharing the PLN file as a Teamwork project. 206874 BIM Server/BIMcloud: User Activities were not up-to-date even after multiple refreshes. 216868 BIMcloud/BIM Server/Crash: In certain cases, it was possible for the Server to crash when multiple clients were authenticating. 215202 BIMcloud/BIM Server: The Manager did not limit the number of login attempts. 217020 BIMcloud: LDAP synchronization failed when an empty custom field was present. 219377 BIMcloud: It was possible for users granted only view permission to modify their own group settings. 218688 BIMcloud: Performance suffered due to a memory allocation routine that slowly served multiple competing threads. 195396 BIMcloud: Projects were not listed correctly on the Manager when ordering was done by Host Server. 198661 BIMcloud: The correct number of used licenses was not always displayed in the BIMcloud Manager. 173999 BIMcloud: The group name in some cases covered action buttons. 217924 BIMcloud: The permission summary column available with the detailed permissions method had refresh problems. A new access rule only appeared after the save button had been pressed. 198528 BIMcloud: The warning message about unsaved changes was confusing. 216894 CRASH: ARCHICAD Some drawings with cropped views of the model crashed the drawing update. 184308 DOCUMENT: Display of the wall-column connection on the layout was different from the source view. 215695 DOCUMENT: In certain cases, the layout was not consistent with the source view. 211094 EDIT: Combined usage of pan and zoom gave unexpected results. 206625 EDIT: Copy and Paste sometimes did not work on Mac. 217105 FILE/DWF/EXPORT: In some cases, grid elements were not exported to DWF. 214802 FILE/DWG/EXPORT/CRASH: Certain linetypes (Regenwater, Afvalwater, FEC 110) crashed ARCHICAD when layouts were published to DWG. 216743 FILE/DWG/EXPORT: Section story level markers didn't export into DWG/DWF from Worksheets. 214791 FILE/IFC/CRASH: A crash resulted, if an IFC parameter referenced a missing library part. 214661 FILE/IFC/EXPORT: A rotated survey point corrupted the IFC Solibri model view. 214385 FILE/OPEN/FREEZE: Vectorial fills containing zero length lines caused ARCHICAD to freeze. 213881 FILE/PLN/CRASH: ARCHICAD crashed from a degenerated plane roof. 213835 FILE/PLN: Migration process of section/elevations was poorly optimized. The result was that large projects took unnecessarily too long to migrate. 217984 FILE/PMK: Occasionally publication to PMKs included elements that were not in their source views. 215733 FILE/USER INTERFACE: Checkboxes couldn't be activated by clicking on them, when their text was displayed in multiple lines. 216997 GDL: Certain doors could appear with the wrong color of fill on the floor plan. 212270 GDL: It was impossible in ARCHICAD to download content from BIMcomponents.com if a proxy server was used. 216867 MODEL/DOCUMENTATION: Layout and source view could be different in particular cases. 214462 MODEL/FREEZE: In certain cases, grid elements caused slowness in 2D zoom/pan. 215248 MODEL/FREEZE: Use of the shadow casting setting in 3D sketch view caused ARCHICAD to freeze. 202949 SPEED: Navigation (panning and zooming) in 2D ShiChuang could become very slow if a large number of splines were displayed. 214554 TEAMWORK/BIM Server/BIMcloud: Incomplete backup files were not removed from file system if backup operation failed. 204281 TEAMWORK/BIM Server/BIMcloud: Messages could not be sent and users were not visible due to mailboxes.db corruption on the server. 219811 TEAMWORK/DOCUMENT: Parts of the dimension could disappear in Teamwork, if some of their points were moved and the changes were sent and received. 217076 TEAMWORK: A reason was addressed for a false warning of an error occurring during the last Teamwork operation. 215602 TEAMWORK: Modifications of dimension elements with missing links resulted in error message during send & receive. 143514 VIEW: Shadows of edges shorter than 1cm in 3D could be noisy in OpenGL. GRAPHISOFT ignited the BIM revolution in 1984 with ARCHICAD, the industry first BIM software for architects. GRAPHISOFT continues to lead the industry with innovative solutions such as its revolutionary BIMcloud, the world's first real-time BIM collaboration environment; EcoDesigner, the world's first fully BIM-integrated "GREEN" design solution; and BIMx, the world's leading mobile app for BIM visualization. GRAPHISOFT is part of the Nemetschek Group.